GitHub is a specialized content hosting silo for code, issues, comments, and static content that has some aspects of a commons, and through free domain mapping, a content hosting service as well. See github-pages for how to setup a static Github pages site! For POSSEing source code to github, see git. While git is inherently distributed, all the extra functionality (issues, pull requests, etc.) that GitHub adds on top is not. GitHub has a nice API for interacting with repositories, which makes it pretty easy to POSSE issues, comments on issues, stars, and maybe more. Plain text notes can be POSSEd to GitHub as a gist. No known examples of anyone doing this yet. Be the first and add your permalinks here! An issue post that is in reply to a particular GitHub repo can (and should) be POSSEd to GitHub as a new issue on that GitHub repo. A reply to a GitHub repo path, may make sense to be POSSEd as a comment on that path, e.g. if it is a gist. If the reply is an issue, see above POSSE an issue. A reply to a specific GitHub issue can (and should) be POSSEd as a new comment on that issue. If the GitHub issue was itself originally posted as an indie issue, then be sure to post your reply as a multi-reply in-reply-to both that the indie issue permalink, and its GitHub copy. A reply to a comment on a specific GitHub issue can (and should) be POSSEd as a comment in reply to that previous comment. A star on a GitHub repo can (and should) be POSSEd as a like of the repo. A reacji to a GitHub issue or comment can (and should) be POSSEd as a reaction to that issue/comment on GitHub respectively. If that GitHub issue or comment was itself originally posted on the indieweb, the be sure to post your reacji as a multi-reply in-reply-to both to the indie issue/reply post permalink and their GitHub copy. Colin Tedford manually POSSEs Github issues, and manually POSSEs and backfeeds comments on GitHub issues (it's just occasional bug reports, so not as onerous as it might be if he were a developer). He does this with the Known plugin to POSSE to GitHub. Bridgy can POSSE issues, comments, stars, and emoji reactions to GitHub, as well as backfeed comments and reactions. 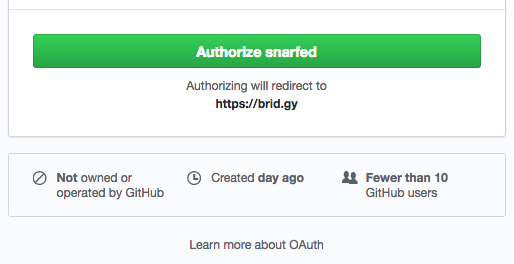 If you get an error POSSEing to a particular GitHub repo using Bridgy, you may need to ask the repo's organization's owner(s) to approve Bridgy as an OAuth app for that repo. If you deploy an application that uses GitHub's API and needs to request the user's permission, it will display an OAuth permissions page that looks like *you* (the author of the application) are asking permission. The solution is to deploy the application from a GitHub organization account for your application, either with the same name as your application, or whatever organization your application is a part of, that you're asking your users to "trust". Any attempt to load a GitHub URL (assuming you were previously logged in) would result in a temporary redirect to that interstitial. You could still view public GitHub URLs in a browser's "Private Mode" without seeing the interstitial (because you were not logged in). There are some self-hosted alternatives to GitHub. Gitlab and Gogs support issue tracking and project management as well. 2016-10-21 DDos attack on DYN affects Twitter, Spotify, Reddit, GitHub, effectively taking them all offline. 2015-03-26 DDoS attack  via unsuspecting browsers executing scripts from (MitM) faked Baidu requests. In March 2017, GitHub updated their terms of service. Several people are upset about the change, which may affect GPL and similarly licensed software. No server is currently available to service your request. 2018-10-21 GitHub experienced over 24 hours of what they called "Degraded Service". 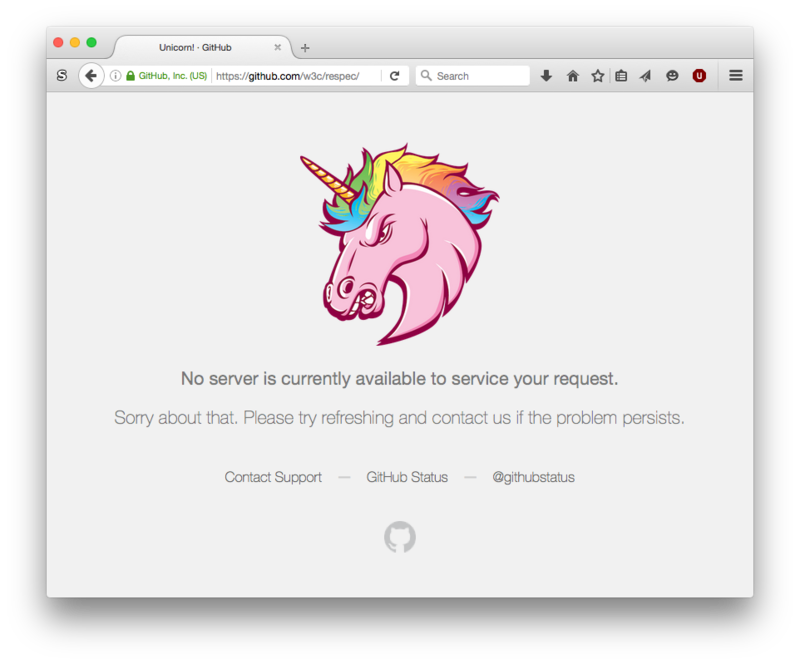 During that time GitHub was effectively "down" for many users and use-cases. This page was last edited on 7 January 2019, at 12:34.